Irish outfit The Pacifics feature the kind of straightforward beach rock you wish you could listen to at a house party or when there’s nobody home. Both of these scenarios call for dancing like there’s no tomorrow, and Quadrafenians fits the bill perfectly. Despite the apparent lack of depth in The Pacifics’ latest effort, their full-on vintage style goes a step further in providing a truly refreshing experience. Although Beatles-era bands could perfectly have been doing this type of tracks, the Irish quartet stands out from the crowd for two reasons. First, it’s not the 60s anymore, which makes new music in this particular aesthetic all the more exciting (and risky from the artist’s point of view). Second, the sound in Quadrafenians (and The Pacifics music as a whole) is ridiculously infectious, something they’re fully aware of and try to showcase at every opportunity. There’s no time for warm-up or closings, just straight rock delight. The EP is also a free download, what else can you ask for? You may hear, for example, the chorus on the catchy-as-hell “Cans, Cans, Cans” going” Get it on, get it on / all night long” to understand this record is about dancing, not analyzing. The distorted guitars and direct percussion often muffle the vocals, and that’s OK given that The Pacifics most often want you moving around instead of contemplating each detail. This is made blatantly obvious in the closer “Burgers & Chips”, which doesn’t talk about much more than, well, these two types of food. 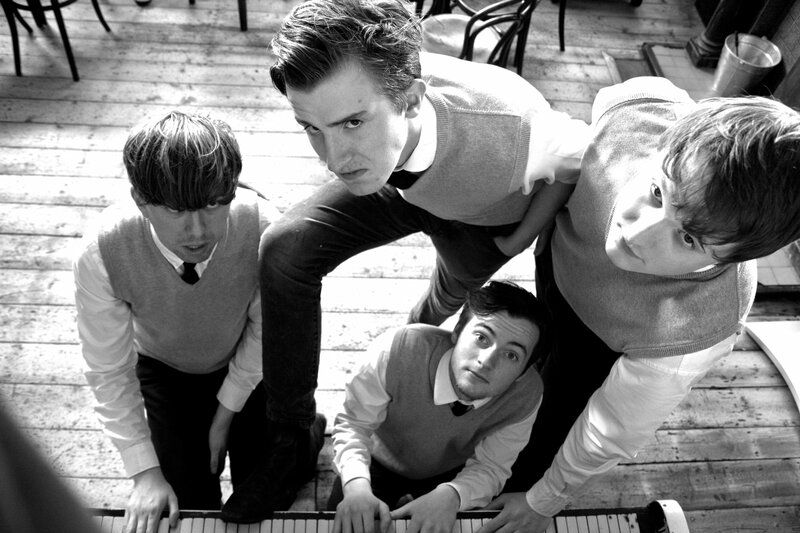 If you’re looking for a refreshing take on retro rock ‘n’ roll, not unlike The Kinks and early Beatles, there’s a treat waiting for you with Quadrafenians. Get your groove on, sweat a bit to them and, if you like what you hear, check out the rest of their work. It’s bound to resonate with you. Favorite Tracks: “Burgers & Chips”, “Cans, Cans, Cans”.